You configured a machine to be a network license server and then installed an Autodesk product on the same machine. When you launch the product, it tries to check out a network license and fails. This seems to affect most 2010 products. Make use of AutoCAD together with an external database. Block attribute values can automatically be updated back and forth to one or many external databases. If you make changes to the attribute values they can be synchronized back to the external database and the other way around. With the new ACAD_db from JTB World this is now possible. ACAD_db works with AutoCAD and all its verticals. Use for example Access, SQL Server, SQL Server Express, Oracle, ODBC or Excel as your database. There are three sync methods available and can be set individually for each attribute to synchronize. Sync only from the drawing to the database. Sync only from the database to the drawing. Some information might be useful to sync in both directions while other information like dimensions needs AutoCAD to be the owner. Other information like price might best be owned by the database. Contact us to get a time limited license file for free and try ACAD_db in your environment. Renovation Extension for ACA 2010 makes it easier to work with the 3 phases Existing, New and Demolition. This really simplifies the work so if you do these kind of works and have subscription just go get it. Others need to wait for AutoCAD Architecture 2011. AutoCAD 2010 Subscription Advantage pack is now available to AutoCAD subscription members. Other have to wait for AutoCAD 2011. Isolate, Add Selected, Select Similar is something that been found in verticals earlier and as 3:rd party tools. With Isolate Objects, Hide Objects and End Object Isolation you get more freedom on visibility of objects that extends beyond layers. There are also two Draw Order tools: Bring Annotations to Front, Send Hatches to Back. These are some useful tools so go and grab this advantage pack. Here is a video showing the features. Both 32-bit and 64-bit versions of AutoCAD® 2010 and AutoCAD® LT® 2010 are compatible with and supported on Microsoft Windows® 7. Autodesk does not officially support 2009 and older versions of AutoCAD and AutoCAD LT on Windows 7. If you choose to run older versions of AutoCAD on the Windows 7 operating system, you may opt to use Windows compatibility mode. During the start of evaluating JTB FlexReport one customer got a problem with Autodesk Network License Manager FlexNet (FLEXlm) that eventually was solved. Stop the licenseservice using LMTOOLS.EXE or in Windows Services. Start the DEP program from Control Panel > System > Advanced > Performance Settings > Data Excution Prevention. This is good news now that residential building also is expected to increase in 2010. This means Revit can be even more used for this industry. Revit Subscription Advantage Pack will include this for Revit Architecture and Revit Structure and is now available for subscription customers. We’ll see how this will compare with MWF from StrucSoft. Do you face problems to automate Autodesk software installers? If you do take a look at this post and the invitation from Autodesk to hear your views (see the comment from Eric Stover). I recognize several of the key points mentioned and know that it is quite some work to automate installations of all kind of applications. The below point for example that requires you to automate a launch of AutoCAD and close it before you can push some of the settings to the client. Make it easier for us to push a custom profile (.arg) and set default shortcuts on the clients. First launch always reverts them back to vanilla configurations, which breaks this. Visit Through the Interface for details on the free webcast. The session will be taking place at 8am Pacific/10am Eastern/4pm in the UK/5pm in Central Europe, on October 20, 2009. If you cannot make it the webcast will be recorded. If you need help to convert or migrate old VBA code to VB.NET or C#, JTB World can help with this service. You’re welcome to contact us. Unable to find main dictionary. Could not start speller. Solution! Here are some reasons why you get the message “Unable to find main dictionary. Could not start speller.” or “unable to find main dictionary could not start spelling” in AutoCAD (or vertical) or AutoCAD LT when you try to add or change text or make a spell check. You have deleted some DCT files in your support folder and might need to restore them from the CD/DVD alternatively make a repair of the installation. Make sure to install dictionaries as feature if you select a custom installation. Even if you don't need multi-language dictionaries you will get an annoying error message every time you want to create or edit text. "AutoCAD Message - Unable to find main dictionary. Could not start speller." If AutoCAD is already installed use Windows Control Panel>Programs and Features and find the AutoCAD installation and select Change or “Add or Remove Features” and make sure "Dictionaries" is un-checked and proceed with the update of the program. You might have deleted the path to the location of the DCT files in OPTIONS. You can check that you have the path to where the DCT file are among the paths in OPTIONS>Files>Support File Search Path. If it is not there add it and restart the application. Another way is to restore the profile but then you might loose a lot of your settings that you have customized. This post was made thanks to an email question I got on this problem and I wanted to give the solution to others that might run into this. Here is a solution I wanted to share on how to use AecAnnoScheduleTagAdd in AutoLISP. The thing is that it's a point that the command expects. "Expects a point or Symbol/Leader/Dimstyle/Edit/Constrain"
ACA_db helps to make use of AutoCAD Architecture or AutoCAD MEP more fully in your BIM process. Property Set values can automatically be updated back and forth to one or many external databases. If you make changes to the Extended Data values within a Property Set they can be synchronized back to the external database. Any Property in a Property Set Definition (PSD) can be exported and all editable Properties can be imported. 6,723 Blogs registered right now. You can register and participate too. The latest version is 11.7 of the FlexNet (FLEXlm) executables lmgrd.exe, lmutil.exe, lmtools.exe and lmadmin. COMPATIBILITY: The version of the license server manager must be greater than or equal to the version of FlexNet Publisher used in the application/application's vendor daemon (for Autodesk it is adskflex.exe). You can always use the latest license server manager and utilities; they will be backward-compatible with your application and its license file. Download them here and select your Operating System. Normally updating is not needed unless your application vendor requires it. But if you experience problems in some way, then it can be a good idea to see if it helps with the latest version. To upgrade. Take backup of the old exe files. Stop the license service(s). Replace the exe files. Start the license service(s). This can in most cases be done even during daytime and the users will not notice anything but it is usually best to wait until there are few users having licenses in use. 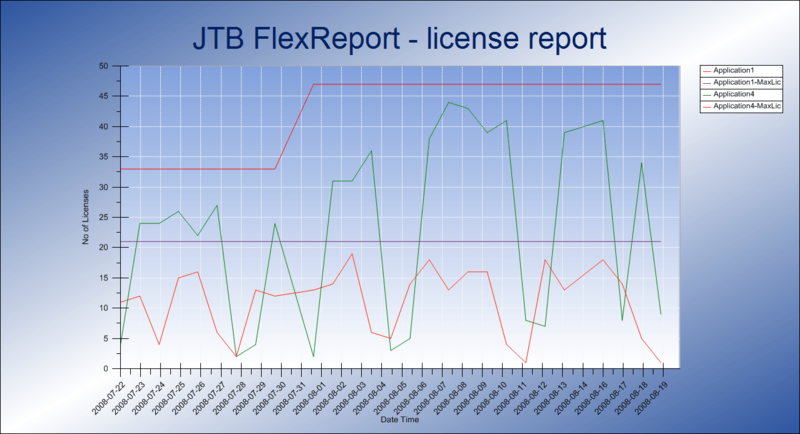 For license usage reports of FLEX enabled software and other software both network licensed and single licensed use JTB FlexReport. Flexera Software was formerly Acresso Software was formerly Macrovision. Under a legal threat from another software firm (ERP software maker Agresso Software) with a similar name, Acresso Software Inc. is changing its name to Flexera Software after just 19 months. I actually thought about this similarity when I heard about the new name Acresso the first time so it is no big surprise considering that Agresso is such a larger company too the smaller Acresso don’t want to go into that fight. Flexera Software sells software such as its installation utility InstallShield, and software license manager FlexNet Manager and FlexNet Publisher (FlexNet/FLEXlm), to software vendors and enterprises. Notice also the change from FLEXnet Publisher to FlexNet Publisher. This indicates we should start to use FlexNet now instead of FLEXnet when we refer to the software that are FLEX enabled like AutoCAD. PS. For an alternative to FlexNet Manager take a look at JTB FlexReport. Here is how to reboot computers in a network without having to go physically to it. I was preparing installers for DWG Explorer Column Handler (DWG Columns) when I run into problem with the 64-bit versions for Vista and Windows 7. I used Visual Studio 2008, a C++ project and a basic setup project with a couple of custom actions to register and unregister a DLL file. The 32-bit setup worked without problems. I first got the following error on Vista 64-bit and Windows 7 64-bit. A DLL required for this install to complete could not be run. Contact your support personnel or package vendor. After trying to create the setup directly on a 64-bit system I was able to install but the uninstall failed like this. I first figured out that I could edit the MSI file with Orca. In the table CustomAction I found the Actions I needed to change. This worked good but needed to be done manually each time. And that worked just great. Now I have installers working for XP, Vista, Windows 7 and both 32-bit and 64-bit. I found this discussion thread interesting as it seems like there now is a version of adskflex.exe available for Linux but it requires you have Maya 2010. It would be good if Autodesk made this available directly from their website as well. Even though JTB FlexReport still needs Windows to be installed on it can report FLEXnet/FLEXlm usage from other operating systems like Linux, Solaris Sparc, etc. The Autodesk Network License Manager for IPv4 networks using Linux® 32-bit or 64-bit Red Hat® Enterprise Linux 5.0 WS (U4). Please refer to the appropriate readme file for installation instructions. SPLM license reporting (Intergraph SmartPlant License Manager) is now supported in JTB FlexReport. Core JTB FlexReport is the same as in 5.1.0 as the SPLM support are added with two separate installers. Contact us if you would like more details, a trial or purchase. JTB Process Monitor that is a module for JTB FlexReport is updated and if you have JTB Process Monitor you should install this update. With JTB Process Monitor standalone application can be monitored and the usage can be reported with JTB FlexReport. The complete JTB FlexReport suite is updated to version 5.1.1 with this update.